The checkout process was like a cheap date: not pretty, but super easy. And at the very end, the best part: A tip calculator! Now let me momentarily digress. My ability to do math in my head is probably rivaled by that of – oh I don’t know- a crack addicted chihuahua. Because of this handicap, I have a pretty odd method of tip-leaving that is based more on the type of service that I’m tipping for than the actual percentage of whatever I paid for in the first place. For dinners, it’s typically between $10 and $20 depending on how often my water glass gets filled up, regardless of whether I’m at Tom’s Diner or Bravo’s. If I’m eating at a really nice place, it’s likely that the Boy is paying, and I needn’t bother about such things at tips. 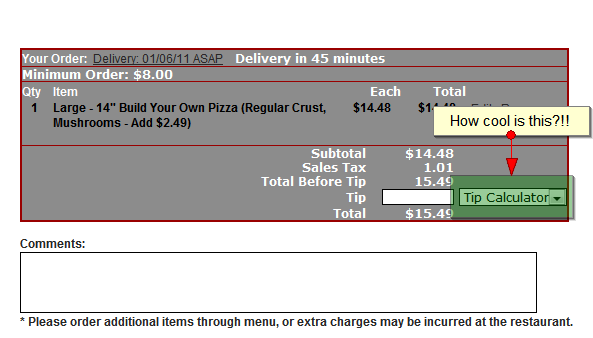 For delivery drivers, it’s usually at least $3 if not $5, depending on the weather, the challenges my location poses, the length of time they have to drive etc. Now back to the story at hand. This awesome tip calculator not only calculated my tip based on percentage of what I paid for my pasta, but also allowed me to simply click on the right number. In this case, 20% was all of $2.90. 20% is also, well, a fair tip for someone who just had to cross a bridge to get to me on a relatively nice day. So that is what I left them. Have you ever been faced with so many options that you decide not to pick anything? I have. Recently. I usually find myself making a midnight run to the nearest Walmart the day before any given holiday to scrape up last gems in the picked over card racks. It normally takes me 10 minutes, because there are a limited amount of cards that don’t have moving parts or sound effects left. It makes my decision easy. Two days ago, I was being completely, uncharacteristically, ridiculously forward-thinking and found myself looking at Valentine’s day cards. 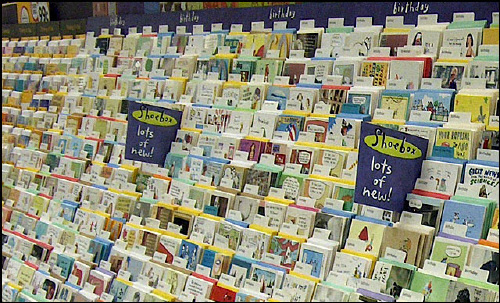 Faced with an entire AISLE full of cards, I found myself completely incapable of making a decision. They were grouped together, but only by relationship (daughter to mother, husband to wife, child to parent etc.) It would have been way more useful if they had been subdivided further into genre (daughter to mother/funny or husband to wife/ risque) That would have limited the quantity of cards that I would have seen initially, but would have made the entire process more manageable, and I would have walked out of there with a girlfriend to boyfriend/funny card and no problem. There’s a very fine line between too many easily accessible options and not enough as any medium to large sized e-commerce site webmaster will tell you. Service Package Size: Many different packages of services. Lots of SAAS companies have this problem. They have the “Deluxe” package, followed by the Really Deluxe, Super Deluxe, Awesome Deluxe, Super Awesome Deluxe, Giant Enterprise Deluxe with a Cookie, and maybe some more after that. One one hand, breaking out services in this way creates more customized packages that are likely to be attractive to almost every conceivable type of client. On the other hand, offering too many graded choices will often cause clients that would potentially want the Awesome Deluxe package to choose the Super Deluxe one instead because they want to save that extra $50 a month. Users typically choose the middle of 3 packages. You can lump your services together however you want behind the scenes, but don’t sacrifice order size just to try to reach everyone at once on the conversion page of your site. Shipping Options: Offering a half dozen shipping and insurance options and carriers is often unnecessary and may cost you revenue, even if the process of choosing these is dead easy and intuitive on the website. Better by far to include insurance (if necessary) in a flat rate shipping cost and add one other rush option at a premium (or a similar two choice process.) If the user made it all the way to the shipment selection portion of the checkout, they’re rather invested and as long as the cost isn’t way outside of their expectations (which you can manage along the way), they will happily pay. You don’t WANT them opting out of an option that can make you money, and by providing those options you’re inviting them to do that. Loss leaders: A website is not a restaurant, and the happy hour model is not always effective. Faced with the choice between an inexpensive single product and a higher-priced gift basket containing that product on the same page, there is a much lower likelihood that the user will choose the more expensive gift basket. Giving them a lower cost alternative in the menu might be a reasonable alternative. Everyone knows copy is really important to a website. From an SEO perspective, it gives the search engines something to index. From a usability perspective, it gives the user needed information to encourage them through the buying funnel. From a… well you get the point. You need copy. Arguably, on a truly nice and usable site, the copy will be formatted in a way that is not overwhelming (broken up by pictures, bullet points, ordered lists etc.) However, sometimes, the sheer volume of product description can actually turn users off. Make sure that you’re taking all phases of the buying funnel into consideration when designing how massive copy will appear on the site. Take care of your impulsive, ready-to-buy clients up top and then let the other information settle into tabs or at least below your strong calls to action. Otherwise, you risk overwhelming your user. Hopefully this post was somewhat helpful. Even though the common sense, often repeated maxims are present, I thought it was interesting to look at how, even if you do everything right, you might still lose money. I think it’s helpful to occasionally remember that there are two sides to a usable site. You want to make sure that you have a site that CONVERTS. In other news, I had a hard time finding good, general examples. Anyone know of any sites that are so usable you want to hit them with your keyboard? Thanks!